A couple of weeks ago I was asked if I would like to review an online takeaway food ordering service and there was no way I was gonna say no! As many of you know, I have been on a mission this year to try and shift the baby-weight, and as such I am usually trying to eat more healthily than my brain (and stomach!) wants me to. So someone asking me to review a takeaway ordering service? That's the stuff dreams are made of! 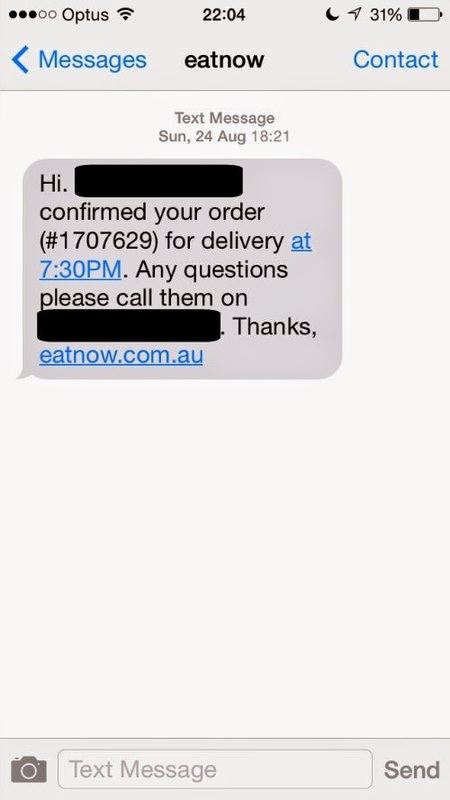 The service I reviewed was EatNow.com.au and I gotta say, I was most impressed. It was super easy to use. The interface is well designed and made a lot of sense. Sometimes when you're trying out a new website for the first time, particularly one that has a shopping element, you can spend ages just finding the buttons you need to click so you can get started. I hate that! Eat Now makes it super easy to find restaurants in your area that are using the service and available to order from. Sadly, being in the area that I am, there weren't a whole lot of options to choose from. We did however find a pizza, pasta & ribs place that we've often talked about trying, and so this seemed like the perfect time. Their entire menu was online and easy to read. I noticed when I browsed through the restaurants in my area, that quite a few of them had special deals, and 10% discount on your first order via Eat Now. After we made our choices it was really easy to see how much we owed, and the checkout process was fast & simple. We had the option of pick-up or delivery, and also what time we would like our food delivered. You could even put through your order while the store was closed. I liked that idea especially, as if you've got some people coming over for a relaxed afternoon who end up staying for dinner and you don't want to cook, you can put your order in as soon as you want. You don't have to wait until they are open! And yes, I am that lazy person who will invite people over and then order takeaway for dinner. I don't like cooking for myself, let alone other people! Why waste my time when I can pick up or have delivered some delicious food that I know most people will love? All in all my experience of using Eat Now was really great. It was simple, easy to use. The website is really well thought out and uncluttered. No annoying pop-ups or flashing crap in the sidebars. The search results were also easy to filter out and narrow down. Sadly I must say that our meal wasn't anything special. It wasn't bad, but Dave and I have pretty much tried every pizza & rib place in our area and they did not knock our favourite place off it's top spot! But then, there are not many places anywhere that are as good as our favourite, so it was always gonna be a hard sell. Also, despite having asked for it to be delivered at 7:30pm, it showed up 6:50pm. Not a huge deal, but it did mean that we had to sit the food in the oven while we got the girls in bed, which is never as good as being able to eat it as soon as it arrives fresh. However those things have nothing to do with Eat Now and everything to do with the restaurant obviously not reading the instructions properly, and it didn't taint the experience. After you place your order you get a handy email summary, as well as an instant SMS confirmation, so you know you've done everything right. There is also an app for iPhone and Android, but I haven't tried that out. Once a few more restaurants in our area sign up to Eat Now we will most definitely be using the service again, and I daresay I'll download the app then. I am an app-junkie after all! So all-in-all our experience was really good and I would definitely recommend having a look on Eat Now to see which of your local restaurants are listed on there. It's a super easy and convenient way to order food without having to call someone up and hope that they take down your order correctly! Have you ever used an online food ordering service? What did you think, would you recommend them or use them again? Disclaimer: I was paid a small fee to review and write this post. However all opinons expressed are my own, truthful ones. As my disclaimer policy says, if I thought it was crap I either wouldn't have bothered publishing it in, or would have told you it was crap from the get-go. I've been using the EatNow app for about two months now. Where I live, just on the border of the Sydney CBD, there is hardly any takeaway places. We have a really good fish and chip restaurant and there's a curry place next door. Ok, there's an Italian restaurant on the ground floor of our building but we don't love their stuff. While the city is teaming with places to eat during the day, there's not much home delivery going on in the evening. That was until I found the EatNow app. I love Asian food but until I got the EatNow app I wasn't aware of any good home delivery Chinese joints. Now I've found one, we have ordered from there five times in the last 7 weeks! The app stores your ordering history so you can just reorder your favourites in a flash. I always request for ASAP delivery. Often, like this Friday just gone, the text came back saying our delivery would be made in 75 minutes. Being a Friday, and a wet one at that, this didn't surprise me. The city is a nightmare for traffic as all the workers try to escape. What did surprise me is our Chinese was delivered HOT within about 30 minutes! Ned's tummy had been rumbling so it was good news for all. I'm sorry your restaurant wasn't up to scratch but I do agree, the EatNow platform is great. I never feel like I'm being overcharged the way other menu sites used to make me feel. As if the restaurant jacked up prices to cover the cost of being affiliated with the site. All in all a great service for us here in Millers Point. So glad to hear the app is good, I might have to get it on my phone. We have a sleeve tacked up on the noticeboard filled with the menus but it is forever falling down and of course the one we feel like is the one that has been destroyed by a roaming toddler!